Wolfe Waves are caused by forces of supply and demand that exist in all markets and all time frames. They were originally discovered by Brian and Bill Wolfe. 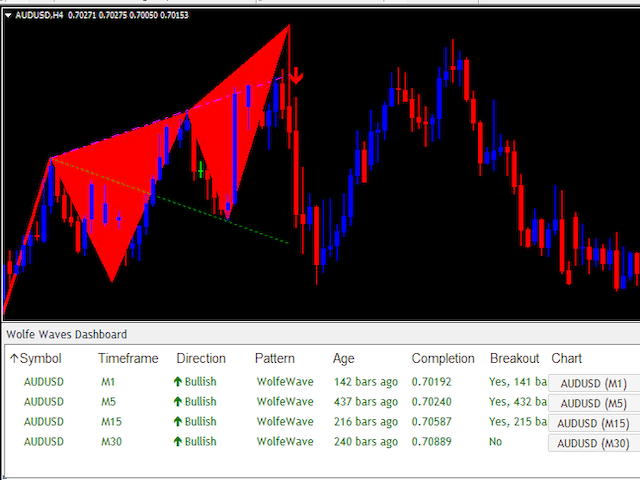 They form patterns consisting of 5 waves where the first 4 define a wedge and the last extends beyond this wedge. This last wave is usually traded. Using the Wolfe wave principles, we can calculate its length by drawing a line between point 1 and point 4 on the wedge and extending this in the direction of the breakout of wave 5. It functions as the profit target line. 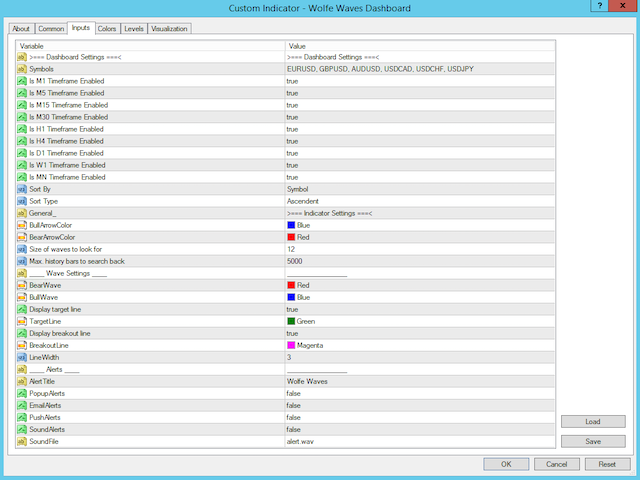 The Wolfe Wave analysis technique can forecast an Estimated Price at Arrival (EPA) and an Estimated Time of Arrival (ETA). The wave preceding the fifth wave, could exceed the extended trendline from waves 1 to 3, before making a large move in the opposite direction. 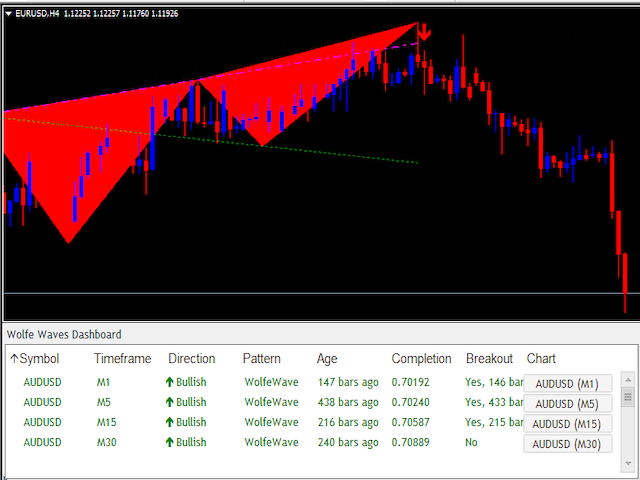 This is the ideal entry point for a trade towards the profit target line. There are specific rules that define this naturally occurring trading pattern. As with any trading method, several variations exist. 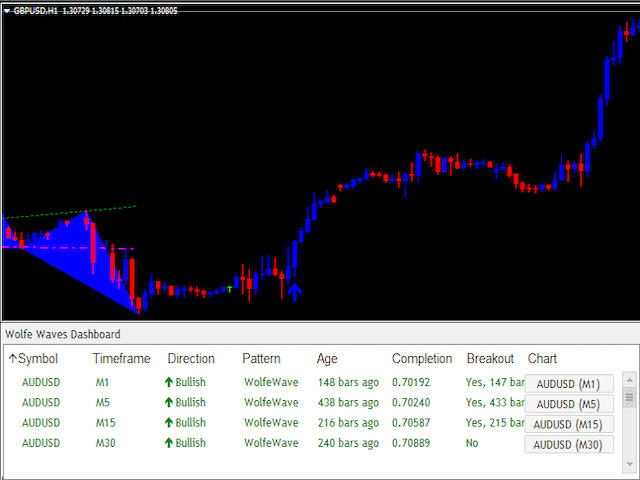 Trades based on this system usually have tight stops compared to the profit target, making for good reward / risk ratios. Symbols - enter the symbols you want to trade, separated by a comma. Use prefix or suffix if your broker uses them.